With bookstores & library shelves already groaning with baking books, what can Sweet offer that the others don’t already cover? 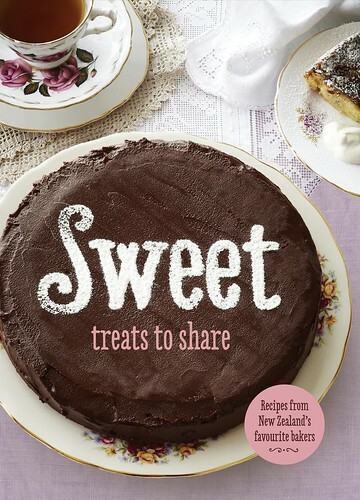 A grand line-up of Kiwi bakers have recipes featured: Dean Brettschneider, Kim Evans of Little & Friday, Sarah Bowman, Alexa Johnston, Annabelle White, Jimmy Boswell & Allyson Gofton. With such a diverse group of contributors, the recipes range from traditional favourites such as Afghan Biscuits & Anzac Bars through to more elaborate Chocolate Espresso Mousse Cake & Chocolate Brioche. A minute after this book had arrived, my teenager, who likes the idea of baking but lacks somewhat in the carry through, had picked out three recipes she wanted me to make. I suggested (politely) that she find three recipes she could make – and therein lies the beauty of this book. It is the perfect baking book for the starter baker. Most of the recipes have illustrations which I’ve discovered helps facilitate the transition into a real baker – as opposed to remaining an enthusiastic baking consumer. Once the Ginger Crunch and Banana Cake are mastered, little-baking-miss (or master) can move on to Lemon Curd Butterfly Cakes and Madeleines. Next time a Shared Lunch rolls around, I know what I will be giving Miss 15 – an apron and this cookbook. On the subject of apples, there are several apple recipes as well as recipes that give an option to substitute apricots for apples. – Granny’s Kitchen Apple & Date Ring: a ring-shaped cake with dates & grated apple, topped with a macaroon. – Allyson Gofton’s Fruit & Spice-baked Apples: the notes suggest that Golden Delicious, Pacific Rose and Braeburn are all good apples for this recipe. A lot of baked apples require dates and nuts, this recipe has neither of these. Instead, the apples are stuffed with sultanas, currants, lemon or orange zest, mixed spice & cinnamon. – Granny’s Kitchen Oaty Apple Walnut Muffins: these muffins feature unsweetened stewed apples, rolled oats, sultanas & walnuts as well as some lemon zest & cinnamon. Sound delish. – Allyson Gofton’s Pumpkin & Prune Cake: this orange-scented cream cheese iced cake uses apple sauce and mashed pumpkin. Allyson also includes a note on how to make apple sauce. 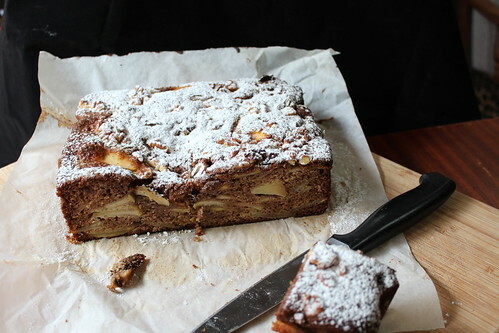 – Annabelle White’s Sicilian Apple Cake: this cake looks and tastes delicious, we had it for our Sunday night pudding tea a few weeks back. Some of the diners didn’t appreciate the pine nuts and say it would taste better without them (the cake wouldn’t be very Sicilian without pine nuts). Although the cake has 4 Granny Smith apples, some would prefer the cake to have more apple. This recipe is also featured in Cuisine Magazine issue #164 (May 2014) page 40. I forgot to take a photo of this cake before it disappeared into hungry bellies – apparently it was also really nice for school lunch. – Allyson Gofton’s Spiced Apple & Walnut Cake: an un-iced square cake using any sort of medium-sized apple. This is a melted butter method – no creaming butter & sugar (hmm, moving this one up the list of cakes to try right away). I debated whether or not to put the walnuts on top – my kids aren’t super fond of walnuts. I put the walnuts on, and shut my ears to the moans…. this is a delicious cake. I’ll make it again (with walnuts). This entry was posted in Book Review and tagged book review, Penguin Group, Sweet by Jo Dohrman. Bookmark the permalink.